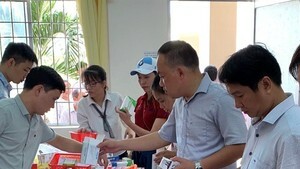 Health authorities in the northern mountainous province of Lao Cai on March 19 reported an outbreak of mumps in Bao Ha Commune of Bao Yen District, with 50 people infected so far. Noticeably, 37 students of Bao Ha Primary School have been infected. Health authorities have vaccinated more than 300 children in the affected district and disinfected villages, educational facilities, as well as given necessary medicines to local residents. Schools scrubbed tables, equipment and disinfected all corners of the school to ensure clean environmental hygiene.